No one seems to know exactly when the ten-foot-wide paper portrait appeared on Hampshire Street. Some think it was March, while others remembered seeing it as early as Day of the Dead in November. Kassa, the owner of a convenience store on the southwest corner of Hampshire and 24th streets, said it was at least five months ago–but certainly after Christmas–that a young woman and man appeared at his door and asked to use his store’s eastern brick wall. “She told me she was a visiting artist from New York and she wanted to put up a piece to memorialize a girl from Mexico who was killed,” said Kassa, 35, who asked that his full name be withheld. At first the store owner, an immigrant from Ethiopia who started his business less than two years ago, was nervous about granting the unknown artist use of the wall. The two visitors promised he would like it, and he relented. “When they put it up halfway, I thought–oh, it is good,” said Kassa. And there starts the story of one of those urban connections that sometimes happens to bring people from different worlds together–in this case, a store owner from Ethiopia and an artist from New York. Soon after the artist put up the image—an intricate paper cutout of branches, flowers, and skulls surrounding a painted portrait of a young woman–the curious and artistic came to look. Kassa too became increasingly moved. 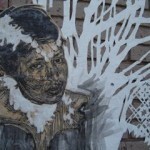 The piece is unsigned, but Rose determined from Internet research that it was probably the work of a 30-year-old Brooklyn street artist who goes by the alias Swoon. 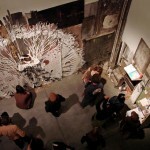 The artist showed an almost identical piece last spring at Yerba Buena Center for the Arts. Though the Hampshire Street version is untitled, the museum work was called “Portrait of Silvia Elena,” and was a memorial to a teenage victim killed in a wave of unsolved murders of women in Juarez, the Mexican border town. The exhibit’s materials explained that the young woman, Silvia Elena Rivera Morales, is portrayed in her quinceañera dress and crown. 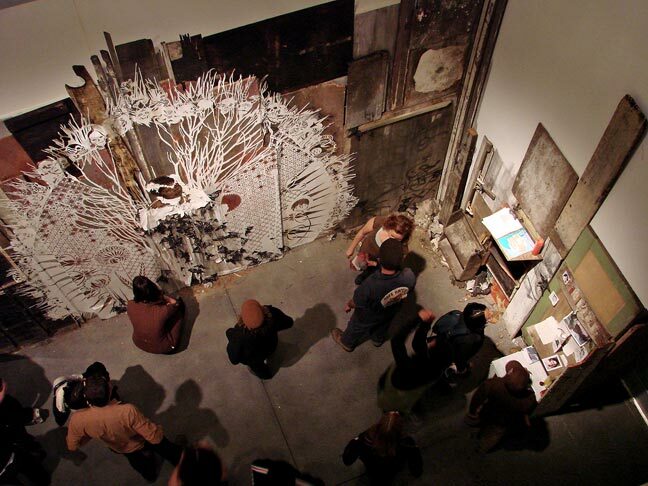 Still another version of the installation was on display at the Honey Space gallery in Manhattan last summer. Carlos David, who lives next door to the Hampshire Street piece, said that though he is unsure of its meaning, he knows he likes it. The 57-year-old custodian has also noticed it has kept the wall graffiti-free. 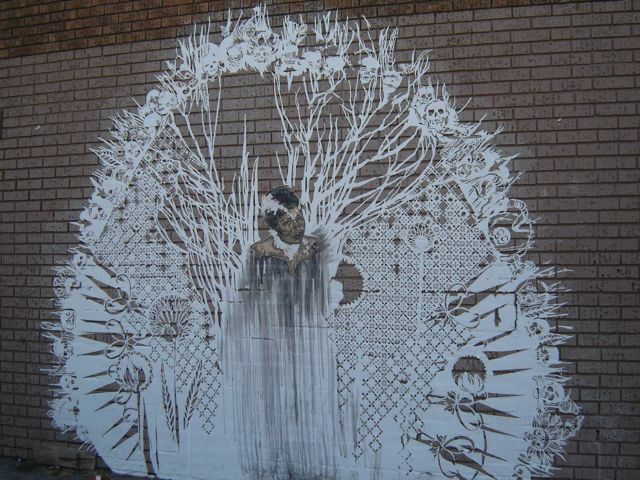 In an interview with a Dutch design Web site last year, Swoon explained that many people don’t get to enjoy fine arts because they feel alienated in museums and galleries. “But when you work outside, you are telling everyone that this work is public and it’s free and it can be part of everyone’s life if they want it to,” she said in the interview. That was the case for resident Elizabeth Bell, who discovered the Hampshire Street portrait by chance one day in early April. Intrigued, Bell visited Yerba Buena to see more of Swoon’s work. Bell’s eyes are now peeled for Swoon’s mark around town. She has noticed a portrait of a woman and child on Osage Alley and another paper female figure on Mission at Sycamore that might be by the artist. Indeed, Rose from Precita Eyes said Swoon has pasted up her work in the Mission before, though she thinks Swoon has grown as an artist since her last visit. 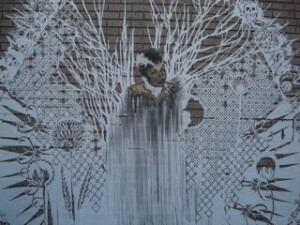 Rose was irked four years ago when a paper cutout she attributes to Swoon appeared on top of an existing mural in Balmy Alley. 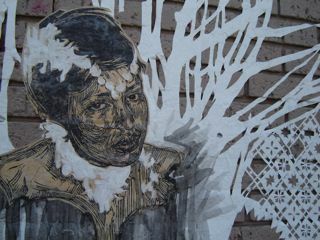 Typically, Swoon, who did not respond to repeated requests for an interview, leaves her street art unprotected against the elements so that it withers, decays, and eventually disappears. Only a remnant of the Balmy Alley cutout is visible today. But Kassa asserts that the artist’s intent was different this time. “She told me she wanted it to be there for long,” he said. He said the artist and her friend told him they were going to apply a final coating to protect it but never returned again. Troubled by the thought that impending rainy season could destroy the piece, Kassa is considering taking action. Precita Eyes sells a gallon of Sheercoat for $68 that can be applied in four coats to protect murals. He is game to buy it if he can find someone to help him shoulder the cost.